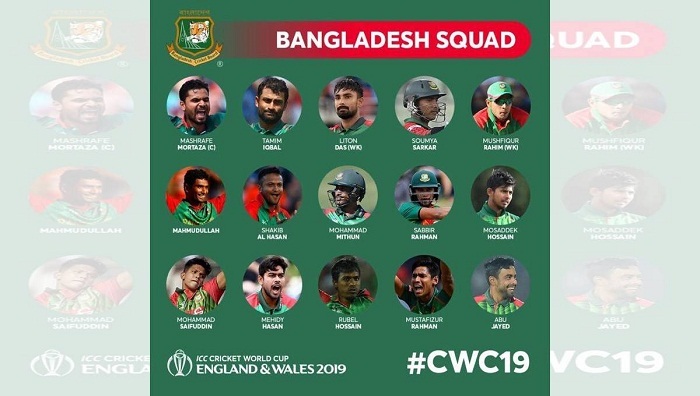 Bangladesh have named a 15-man squad for the World Cup Cricket-2019 scheduled to be in England. Mashrafe Bin Mortaza will lead the squad in the world Cup Cricket of this year. The members of the squad are: Mashrafe Bin Mortaza(captain), Tamim Iqbal, Shakib Al Hasan, Mushfiqur Rahim, Mahmudullah Riyad, Liton Das, Mohammad Mithun, Soumya Sarkar, Sabbir Rahman, Mehedi Miraz, Rubel Hossain, Mustafizur Rahman, Abu Jayed Rahi, Mohammad Saifuddin and Mosaddek Hossain.